Make the media outlets work for you. Imagine you're asked to give a television interview about your company's new "green" initiatives. Does the thought make you nervous? What if you say the wrong thing? What if you have no idea how to answer a question? Or, what if your boss tells you to write a press release, and send it to local media outlets? How do you craft a compelling story or statement that journalists will actually want to write about? Many people may feel daunted about working with the media. If you've never done an interview or written a press release, you may feel as though you want to avoid putting yourself in the spotlight. The right kind of media exposure can help your organization, and at some point, you may be put forward as a spokesperson, especially if you're an expert in your field. If you work for a large company, you might have a communications department to help you write the press release or coach you through the interview process. If you're part of a smaller company, however, there may be no one to offer advice. If so, this article is for you. 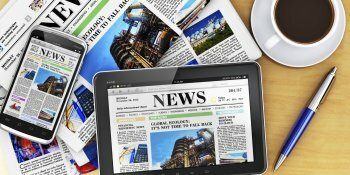 Read on to discover the basics of writing a press release and how to prepare for an interview. Many companies issue press releases all the time. A press release is simply a structured "announcement" about something that's happening in your organization. It's a way to gain exposure for your company – but only if it's a story that's interesting enough to publish.